2 Sets of Penn Alumni Vie For A Superbowl Commercial Spot + 1 Million Dollars! As far as I know, there are currently 2 sets of Penn alumni who have entered their commercials into the Doritos "Crash the Superbowl" Competition. Per Scott, "Our ad started from the simple idea of people making pointless status updates on sites like Twitter and Facebook. However, the joke is that, unlike in real life, everybody cares. Our nefarious plan is to have it air during the Super Bowl and have everybody updating their status as "BLANK just ate a Dorito." 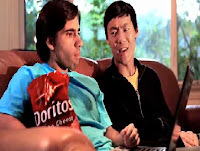 2) Comedian and Writer, Matt Rittberg (L'05) appears in this commercial below entitled "Opposite Reaction": Does Newton's third law, "For every action there is an equal and opposite reaction" hold true for Doritos? Any other Penn undergrads or alumni also submit to this contest? Email me at merosler at gmail.com!